The Hugh Hodgson School of Music’s holiday concerts will be Nov. 29 and 30 at 7:30 p.m. in Hodgson Hall. Get into the holiday spirit with an evening of music that celebrates the season with a program of sacred and secular music. The University of Georgia’s Hugh Hodgson School of Music’s annual holiday concert will take place Nov. 29 and Nov. 30 at 7:30 p.m. on the Hodgson Hall stage. Audiences will be able to enjoy the talents of hundreds of singers and instrumentalists from the choral and large ensembles of the School of Music. 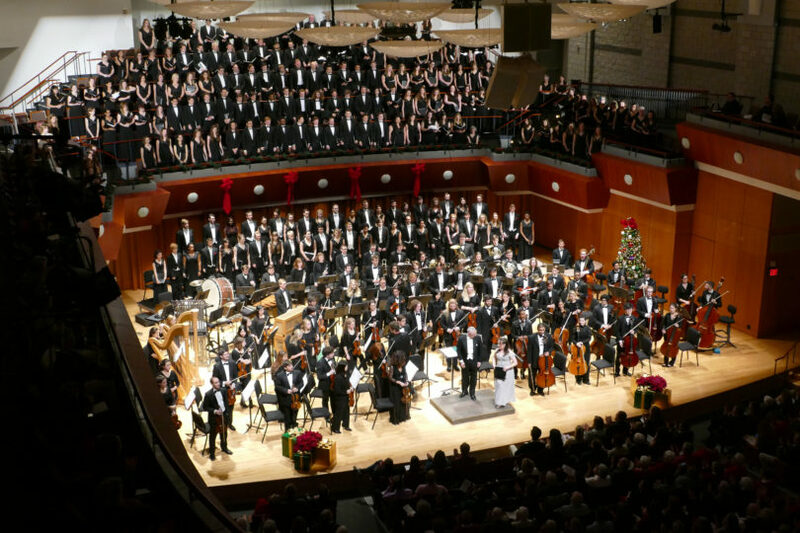 “The sheer size and scope of the performing forces make this concert special. That the concert comes at the end of the semester as the holidays approach makes it particularly fun for such a collaboration for our students and faculty,” said Daniel Bara, the John D. Boyd UGA Foundation Professor of Choral Music and director of choral activities. The Men’s and Women’s Glee Clubs, University Chorus, Hodgson Singers, African American Choral Ensemble, the UGA Symphony Orchestra, British Brass Band and several vocal soloists will be performing. The conductors will be Bara; music faculty members JD Burnett, Mark Cedel, Gregory Broughton and Philip Smith; and graduate conducting student Jean Gomez. As part of the Thursday Scholarship Series, the proceeds from this concert go toward scholarships to young musicians. Tickets, which are $25 for adults and $6 for students and children, can be purchased online at pac.uga.edu or by calling the Performing Arts Center box office at 706-542-4400. For those unable to attend the concert, live streaming will be available online at music.uga.edu/live-streaming.